These beloved crystal angels will give your loved ones a sense of protection and hope. A wonderful choice for Christenings, Baptisms, First Communions, and more! 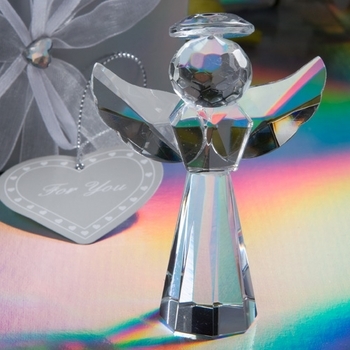 Each crystal angel measures 3 inches tall by 2 1/8 inches wide and is made of glistening multifaceted clear glass crystal. Arrives resting on a bed of white satin and safely enclosed inside a silver heart box, she is secured with a white satin and organza ribbon beautifully fastened into a bow. A crystal heart is added on top with a silver heart shaped tag that says "For You" on it. Minimum order is 15. Please note: The "For You" tag pictured in the photo above cannot be personalized. Custom Personalized Tags or Stickers can be purchased ($.35 each favor) so you can add your own personal touch to each! Add Custom Tags or Stickers?